To configure and install hopTo Work for Citrix® on your Microsoft® Windows™ server, you’ll need to have Administrator status. Note: The recommended setup is that Active Directory must be configured. You can then use your Active Directory corporate account and your Active Directory credentials to log in and access Remote Desktop Services. Note: hopTo Work for Citrix does not support Citrix® NetScaler®. 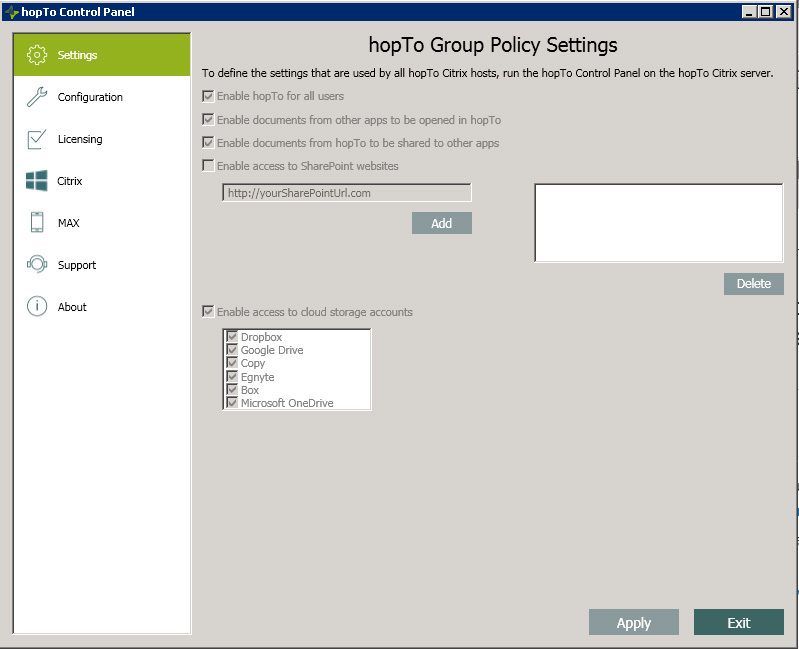 This guide provides instructions for installing and configuring the hopTo Work Agents for Citrix, using the hopTo Work Control Panel, important references for Remote Desktop and Active Directory, and installing the hopTo Work Citrix Client App, with a link to the App Getting Started Guide. 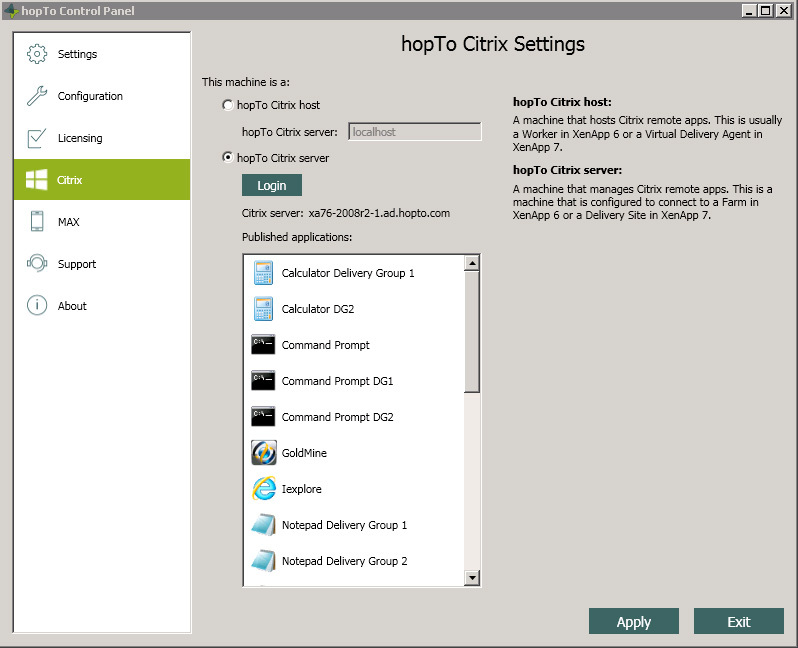 Download and install the hopTo Work for Citrix Agent on all of your Windows machines. 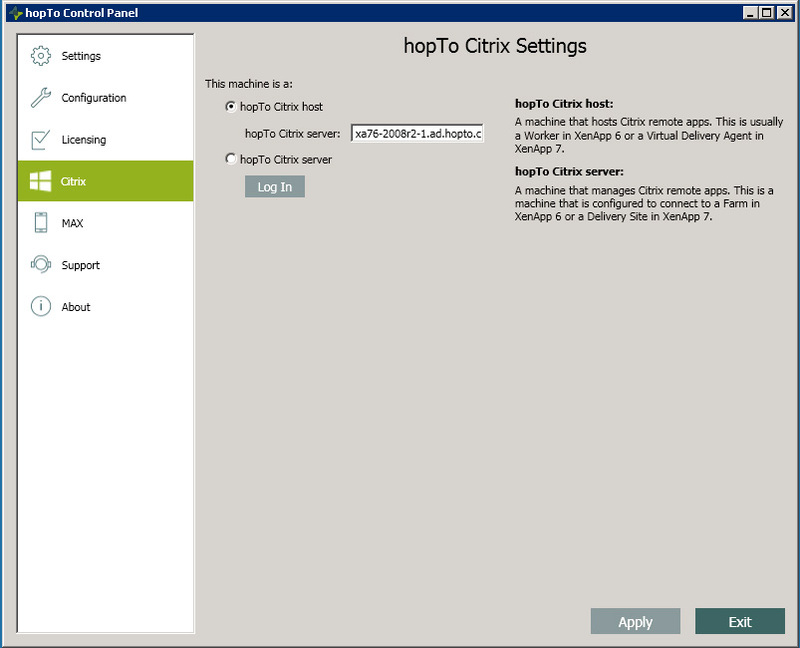 Configure the hopTo Citrix Server and hopTo Citrix Hosts in the hopTo Work Control Panel. Note: The Control Panel settings are different for the Server and Host(s), so you need to configure both the Citrix Server and Citrix Host(s). 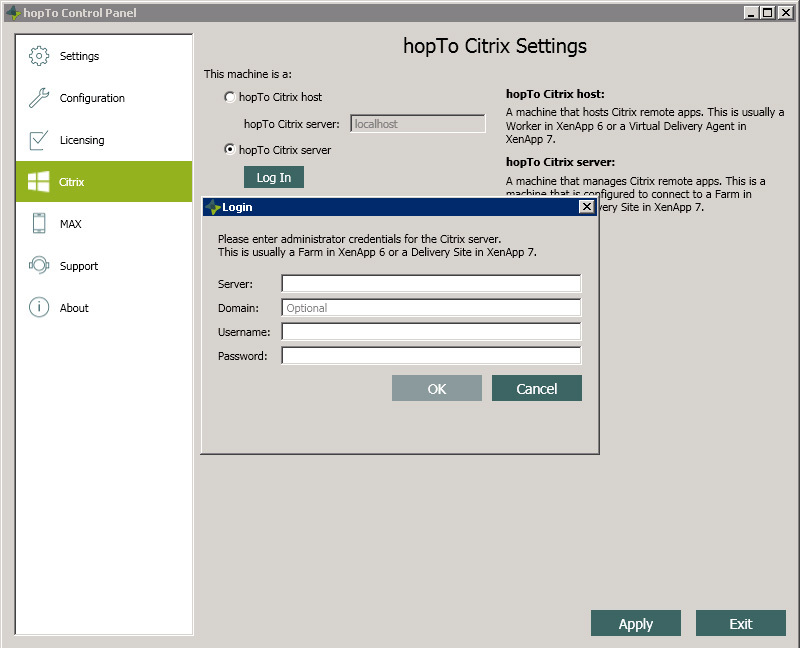 hopTo Citrix Server — The administration server for hopTo Work Citrix integration. 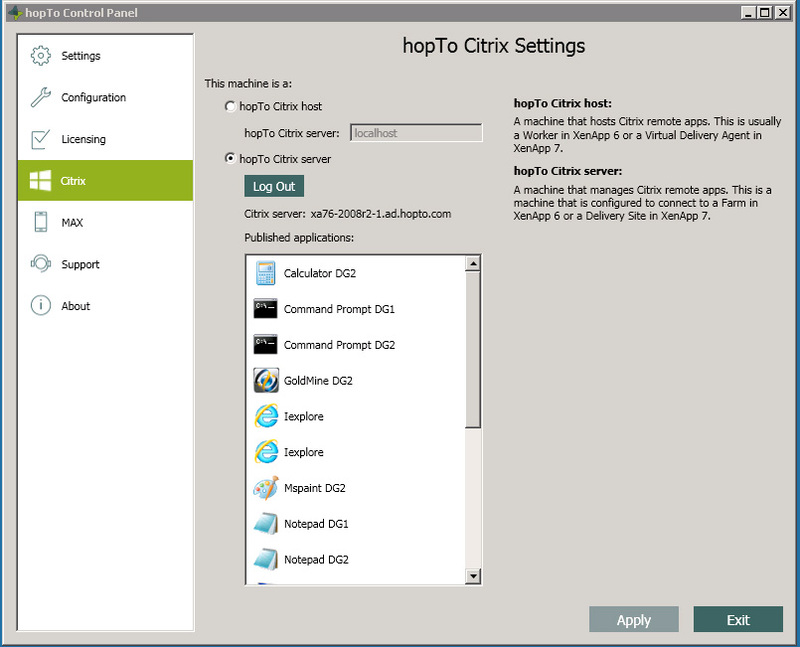 hopTo Citrix Host — A Citrix-enabled hopTo Host that communicates with the hopTo Citrix Server to provide access to Office and Published Applications. 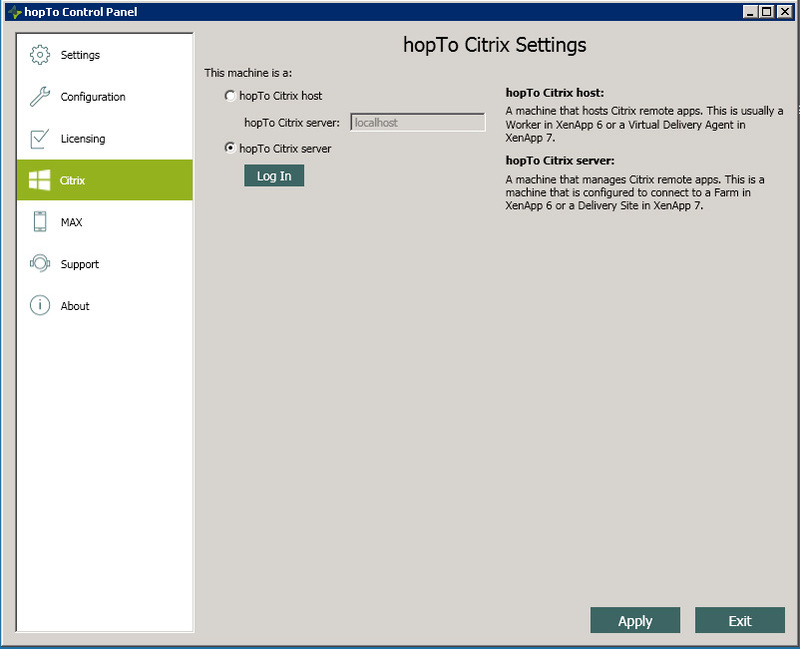 Follow these steps to install the hopTo Work for Citrix Agent on each Citrix machine. 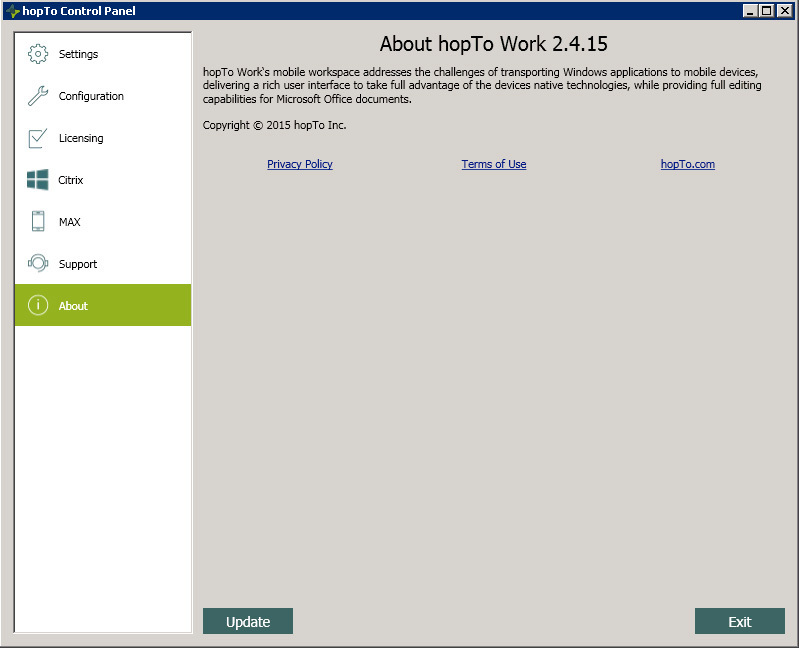 Download the hopTo Work for Citrix Agent installer from the hopTo Work Web site. This table shows the relationship between the hopTo Work software components and the Citrix software components. The hopTo Work Control Panel lets you set up and configure the hopTo Citrix Server and the hopTo Citrix Host(s) for GPO settings, licensing, Citrix published apps, and customizing toolbars with the MAX Editor for the apps running on the client device. 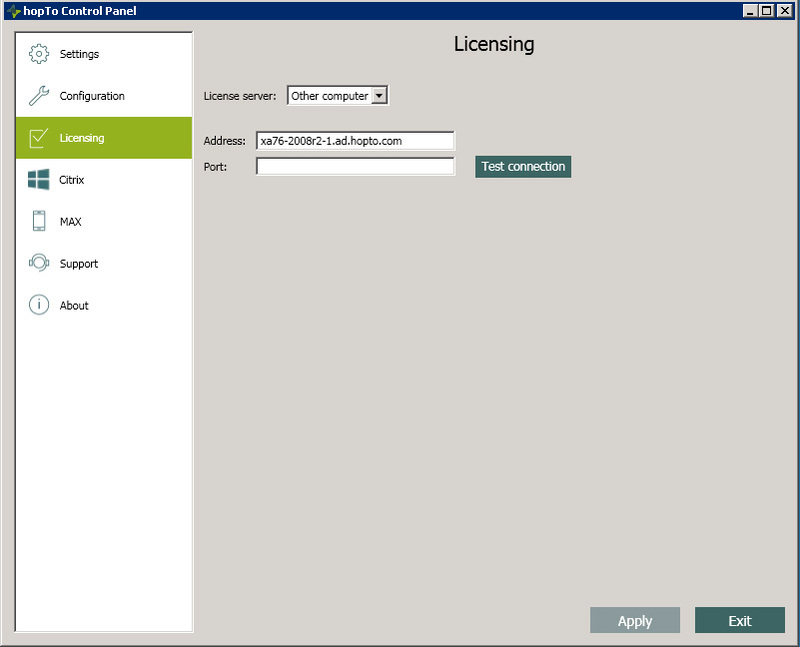 Be sure to follow the instructions in the Licensing section to activate permanent licenses and specific users after the 30-day trial license (included in the download) expires. Please set up the machines in this order. Each section includes screenshots and detailed instructions. Log into the machine that you will delegate as the hopTo Citrix Server, which must be the machine that will run Citrix Studio or Citrix AppCenter. Open the hopTo Work Control Panel. You can edit the Group Policy Settings at any time for all users. These settings affect all hopTo Citrix Hosts. 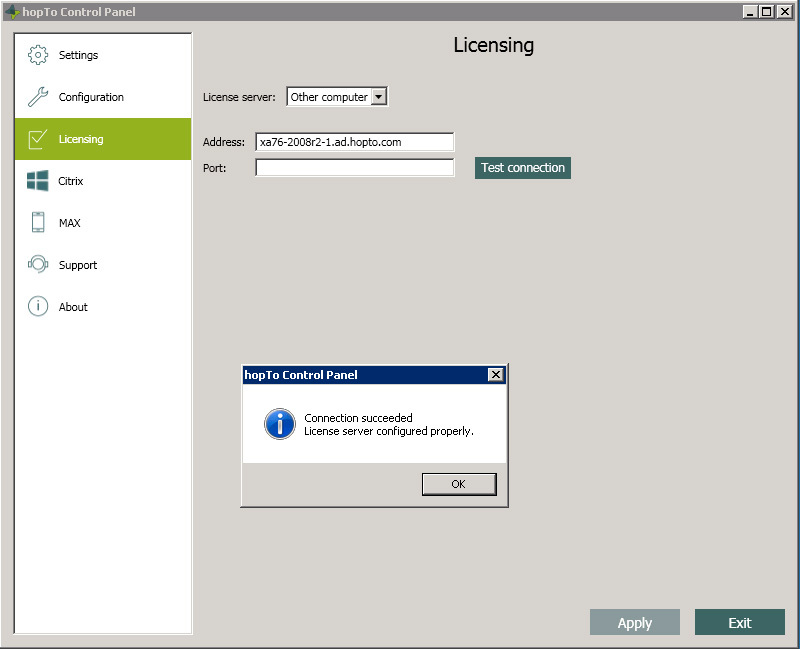 Once you configure the hosts to connect to the licensed Citrix Server, the hosts will retrieve the settings from the hopTo Citrix Server. Note: You can also configure settings on a specific host by using the Group Policy Object Editor. 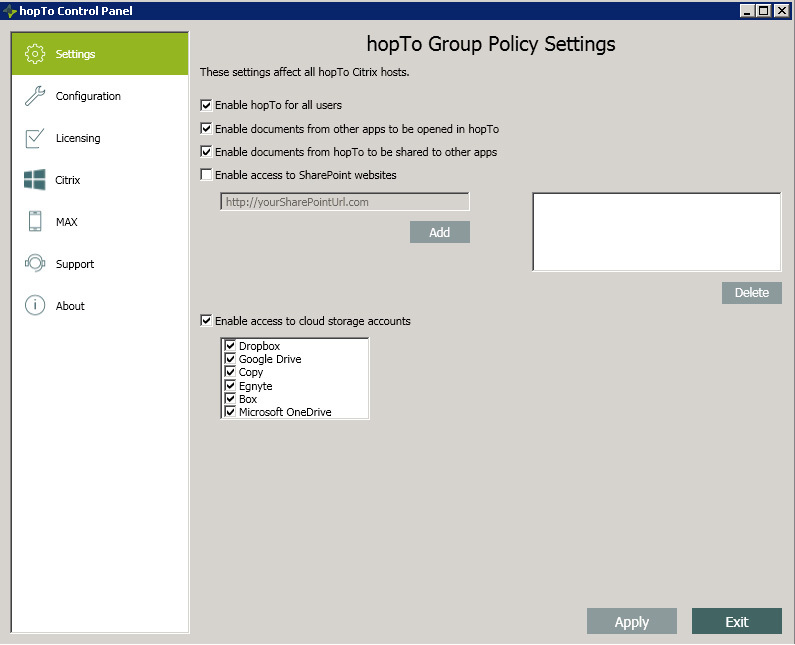 When you configure settings on a host with the GPO Editor, those settings will override the settings on the hopTo Citrix Server for that specific host. The settings are defined on that host and will be used by that host. Note that the new settings will not take effect for currently logged in users until they log off and log back in. Enable hopTo for all users: Allows users under this GPO to connect to hosts using the hopTo client. 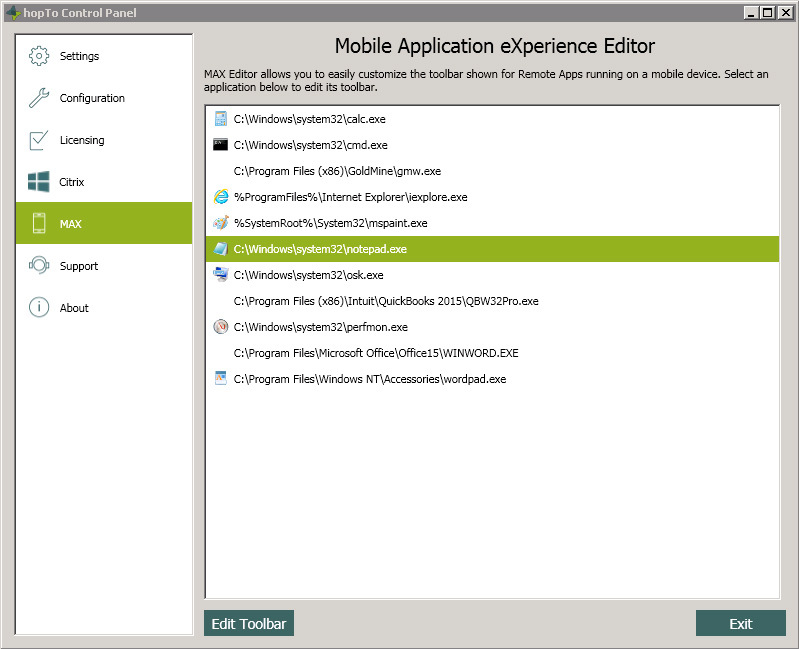 Enable documents from other apps to be opened in hopTo: The hopTo app supports opening documents from other applications. Generally, this feature can pose a potential security risk as it allows external documents to be saved in the secure hopTo Work environment. This setting is not stored in a policies key. Enable documents from hopTo to be shared to other apps: The hopTo app supports a variety of file sharing capabilities, such as “Email as attachment”, “Open In…” to open documents in other apps on the client device. Generally, these features can pose a potential security risk as it allows documents to leave the secure hopTo environment. This setting is not stored in a policies key. 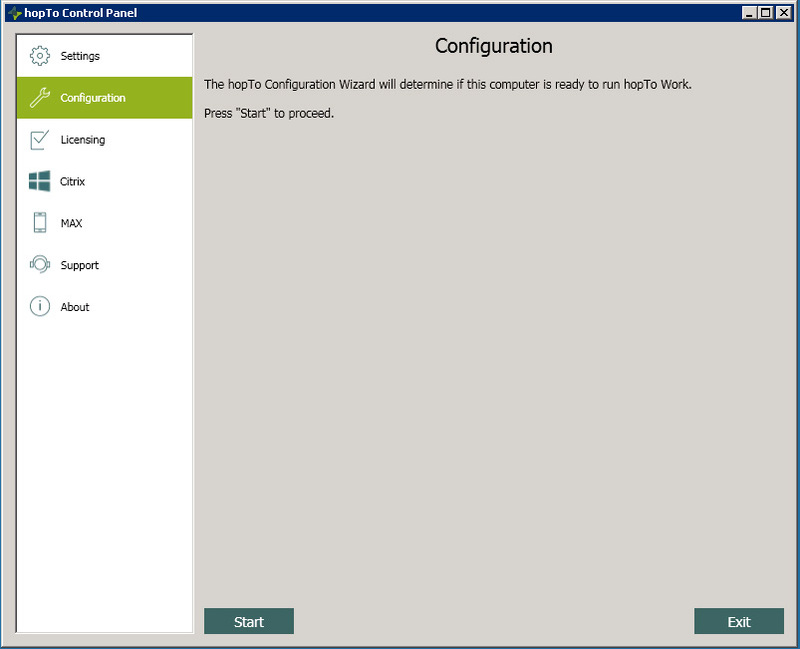 The Configuration Wizard verifies that your system is compatible and ready for hopTo Work. If a category is not compatible, a red X appears with a help link next to it. In this sample screen, you can see that three of the four items have been completed while the Office version and activation have a red X. This is because Office is not required on the Citrix Server and is not installed. When you install the hopTo Work for Citrix Agent, a 30-day trial license is installed on the server, beginning on the day that you install it. The trial license allows up to 15 users to run hopTo Work concurrently. More than 15 different people can run hopTo Work during this period, but only 15 people can access the hopTo Citrix server at any given time. 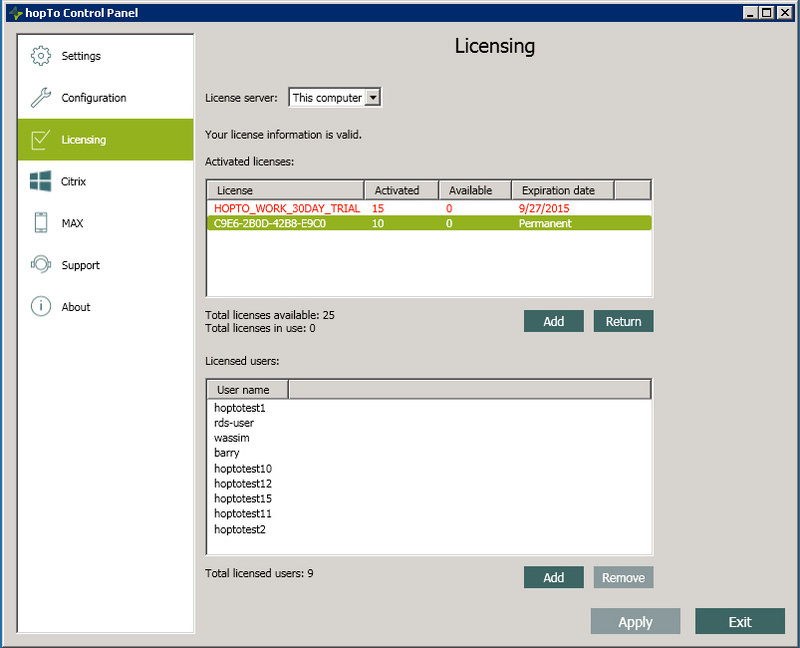 When you activate the permanent license server, you’ll also add individual licensed users (required). For the License server, choose “This computer”. 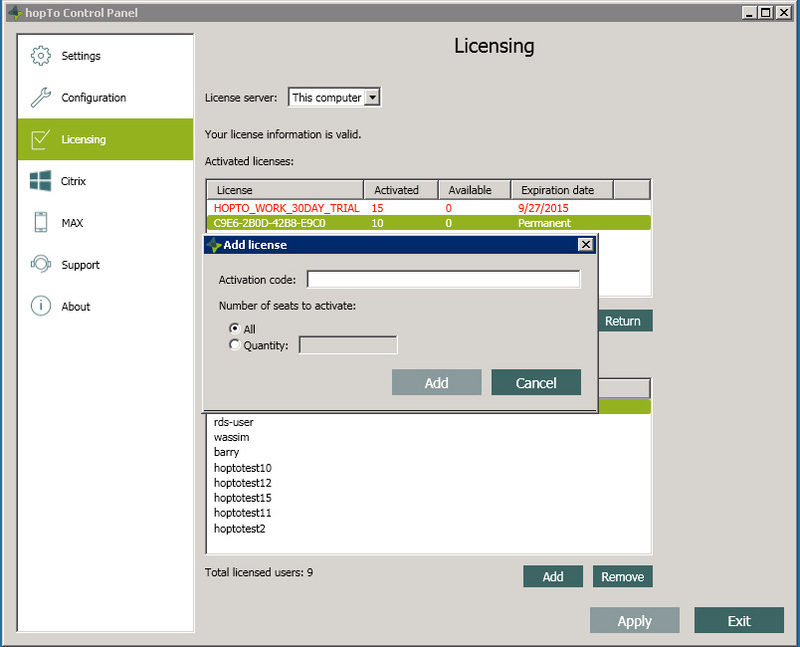 Under Activated licenses, choose the Permanent license and click the Add button. Enter the Activation code and the number of seats to activate. Click Add. Note: If you click Apply without having added any licensed users (required), the license server will not restart and you’ll get a message saying you must have a name in the list. 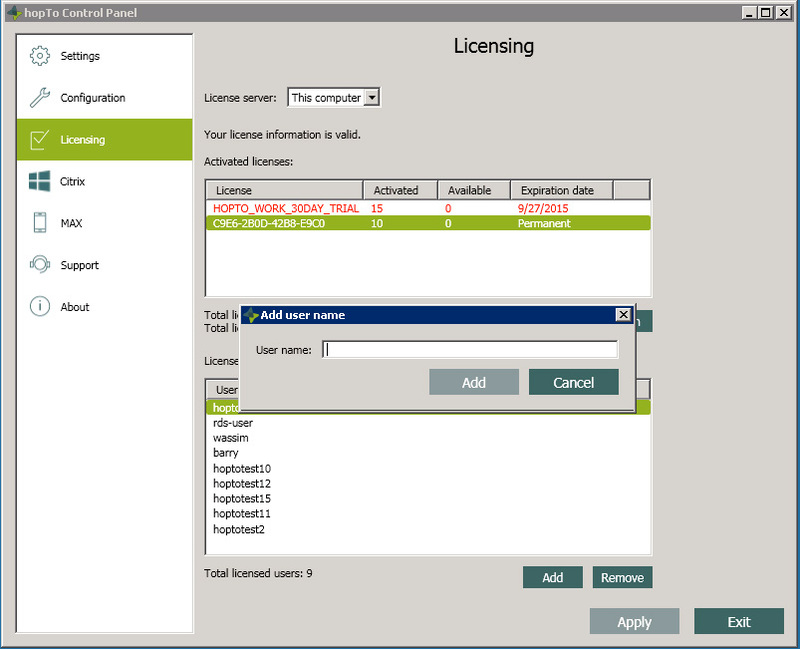 The best method is to add the license information, add the users (described below), and then click Apply. The license server will restart at that point. If the activation code is incorrect, you will receive an error message. Re-check the activation code and try again. You then need to add individual user names to this license. You must do this for every user who will be licensed. Click the Add button below the Licensed Users field. Enter the name in the User name field and click Add. Add as many users as you need. When you’ve added all the users, click Apply. This action will restart the license server. Note: If there are no users in the list, the license server will not restart, so be sure to add at least one user name to restart the license server. Set up the Delivery Controller—the same machine that will run Citrix Studio or Citrix AppCenter—as the hopTo Citrix Server, which will manage Citrix remote apps. 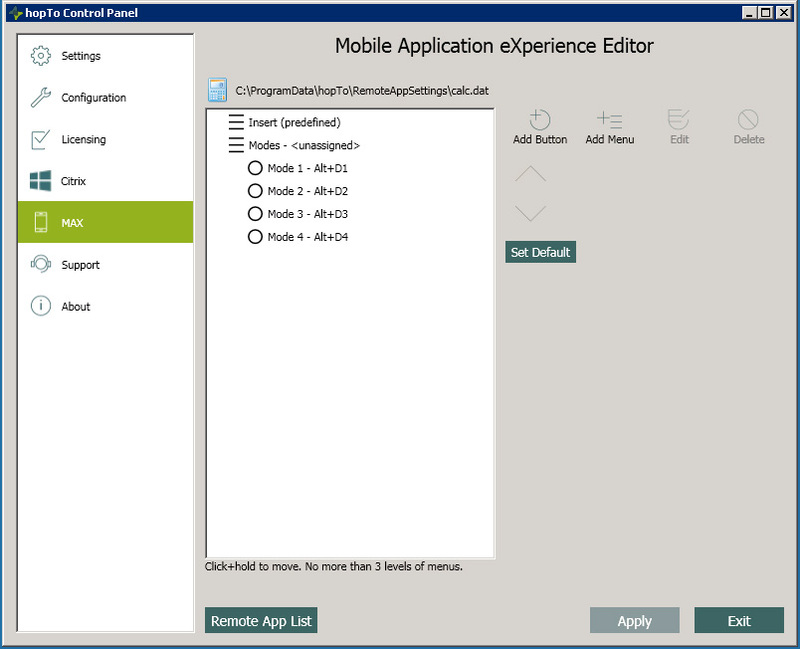 Note: You need to configure and publish Citrix remote applications (Delivery Group 1 and Delivery Group 2, for example) in the Citrix Studio. Published remote apps will appear on the hopTo Work Citrix Server Control Panel once you log in to verify the hopTo Citrix Server connection. Published remote apps will become available to users on the client device once you connect your hopTo Citrix Host(s) to the hopTo Citrix Server. See Control Panel for hopTo Work Host. To verify that the Delivery Controller has been set up as the hopTo Citrix Server and that it is connected, click Login. Enter your administrative login credentials in the Login pop-up window for this computer and click OK. If you get this message, re-check your credentials and log in again. On the hopTo Citrix Server, you can create shortcuts, custom toolbar buttons and menu items for hopTo Work Citrix published apps. 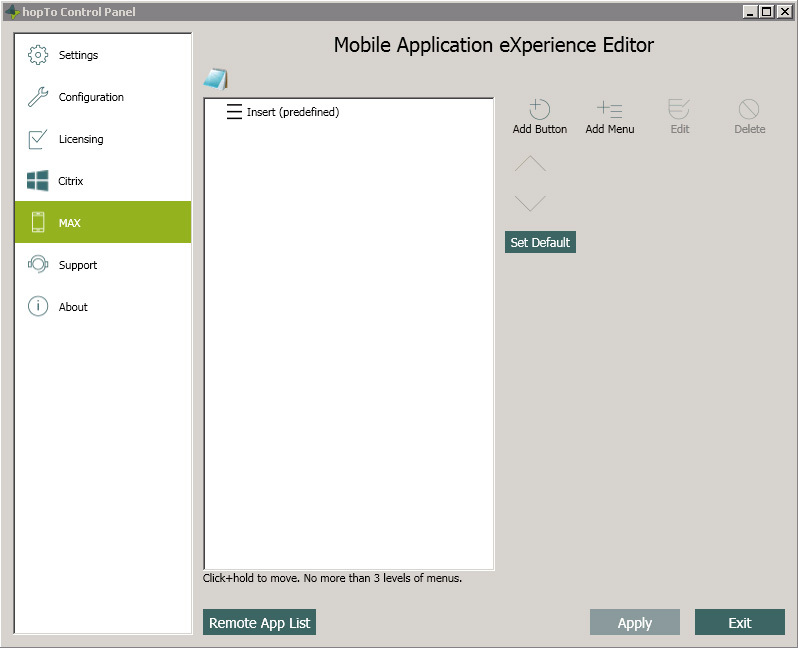 Toolbar buttons and menu items will appear in the toolbar of the Remote App that is running on the client device. All hopTo Citrix Hosts that are connected to the hopTo Citrix Server will run the published apps. Menu items have the added advantage of offering sub-menu items, which appear in another toolbar just above the main toolbar. 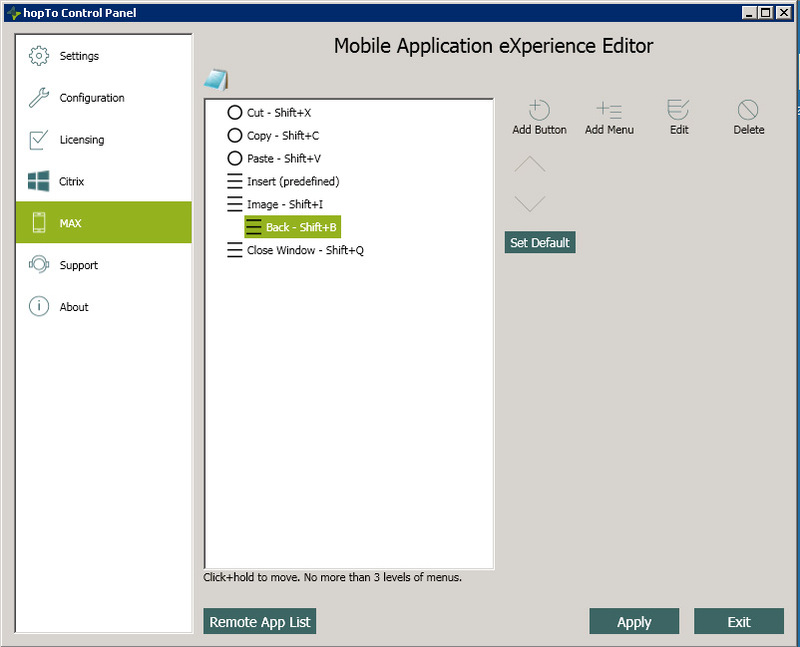 Select a remote application, in this example the Calculator app, and click Edit Toolbar. This sample shows that four buttons have been added. The following screens describe how to add buttons and menu items. 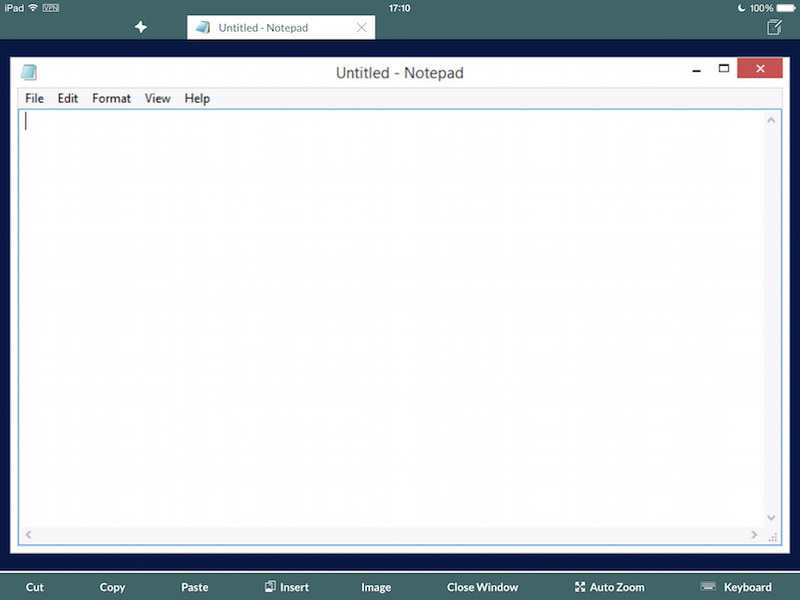 In this sample, we chose the notepad.exe app from the Remote App. Click Add Button to add a button. Enter the label name and shortcut. In our sample in the next screen, we chose Cut and Shift+X. Click Add to add the button label and shortcut. In this sample screen, you’ll see two more buttons added. You can then add menu items in the same manner. Click Add Menu. Enter a label and a shortcut, and then click Add. Continue adding menu items, including nested items (up to three levels) until you’ve customized the toolbar the way you want. Click Apply to save your toolbar buttons and menu items. Once you do this, these toolbar and menu items will be available on the client device in the published app. View the customized toolbar in the published app (Notepad) on the client device. You can see Cut, Copy, Paste, Image, and Close Window. The Support page gives you immediate access to the hopTo Helpdesk and lets you report an issue. 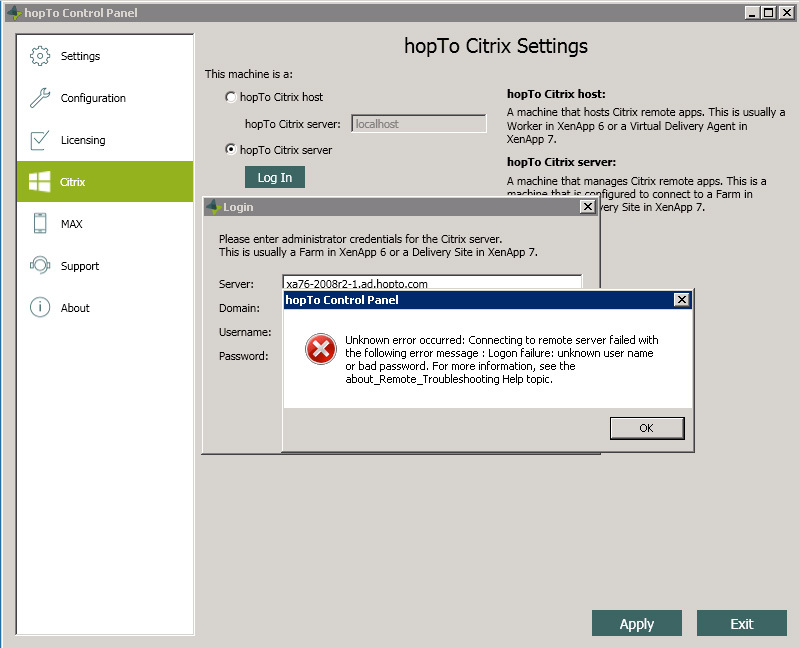 If you are not sure on which server the error occurred, please provide a report from each machine, including the hopTo Citrix Server. Log into the machine that you will be using as a hopTo Citrix Host. 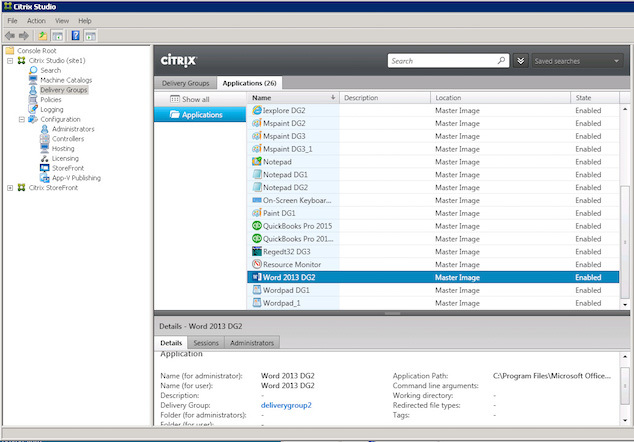 This will be one of your machines that runs the Citrix Virtual Delivery Agent 7.6 or Citrix XenApp 6.5. Open the hopTo Work Control Panel. Note: You must configure the Control Panel for each Host that you’ll be using. The Settings are correctly grayed out as you can only configure these on the hopTo Citrix Server or by using the Group Policy Object Editor. See the References section for more information on Group Policy management. Note: When you configure settings on a host with the GPO Editor, those settings will override the settings on the hopTo Citrix Server for that specific host. The settings are defined on that host and will be used by that host. In this sample screen below, you can see that everything is verified, including activation of Microsoft Office, which runs on the hopTo Hosts that are connected to the hopTo Citrix Server. For the License server, choose “Other computer”. Verify that this hopTo Citrix Host is pointing to the hopTo Citrix Server address or on whichever machine you have established your licensing server. To ensure the connection is correct, click Test connection. If the connection is correct, you’ll see the verification pop-up window. If the connection is incorrect, an error message will appear. Check to make sure the License server is set to “Other computer” in this screen, and check the address of the hopTo Work Citrix Server or whichever machine you designated as the licensed server. 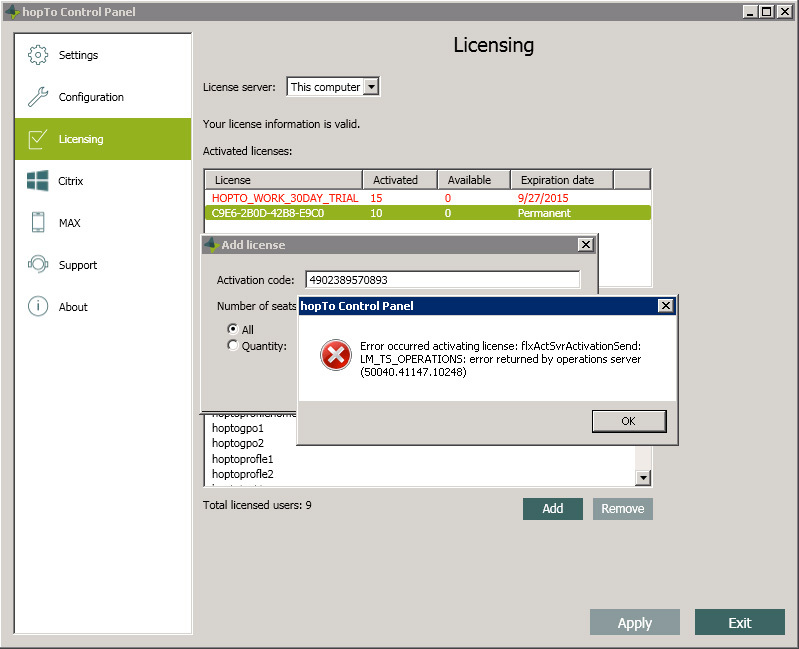 If you still get an error message, check the network connectivity to the license server. Verify that this machine is checked as a hopTo Citrix Host and that it is pointing to the hopTo Work Citrix Server address. This screen explains that all configured hopTo Citrix Hosts use the toolbars that are configured on the hopTo Citrix Server. See the MAX section in the hopTo Work Citrix Control Panel. 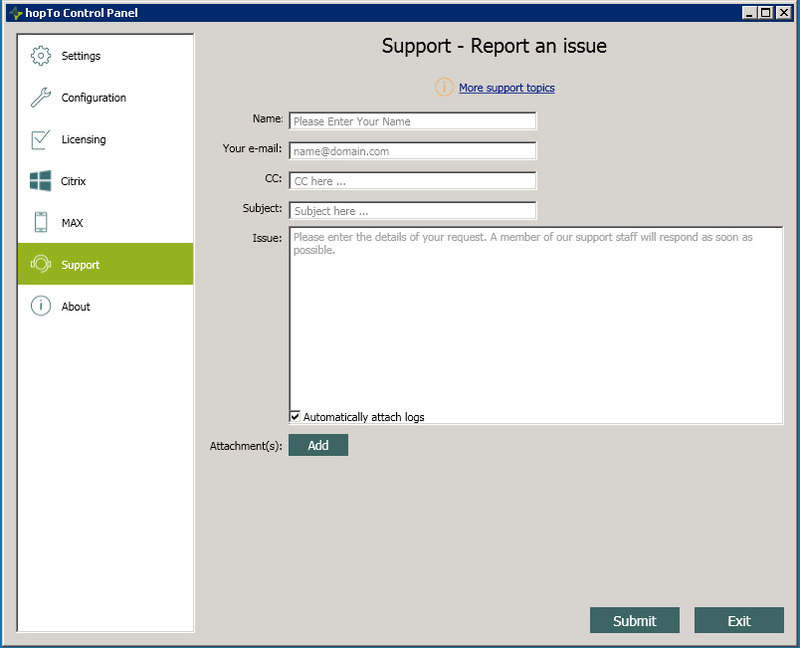 The Support page gives you immediate access to the hopTo Helpdesk and lets you report an issue. Note: You should report an issue from each hopTo Work Citrix Host. 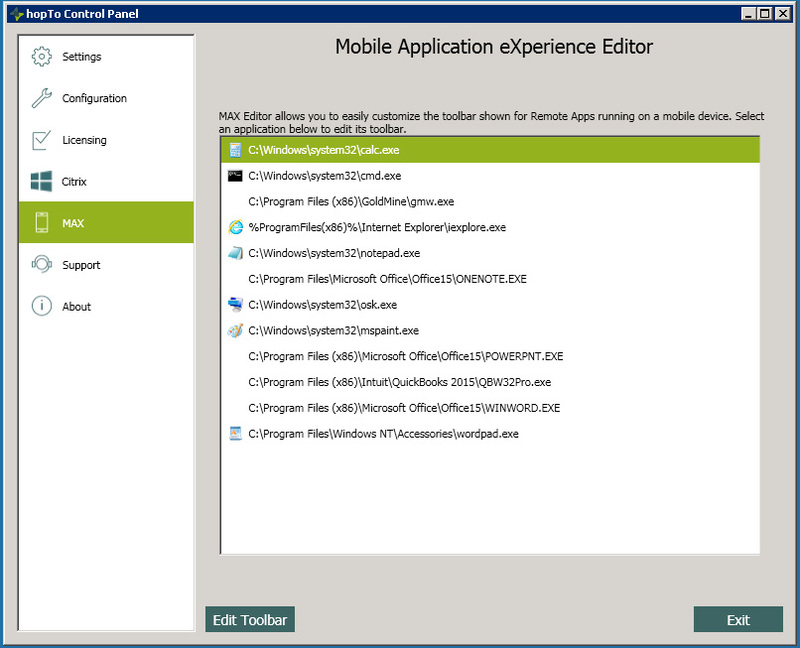 This is a brief overview of what you should expect to see in the Citrix Studio on Xen 7.6, in the Citrix AppCenter on Xen 6.5, on the hopTo Citrix Server, and hopTo Work Citrix Client once you’ve published your apps. 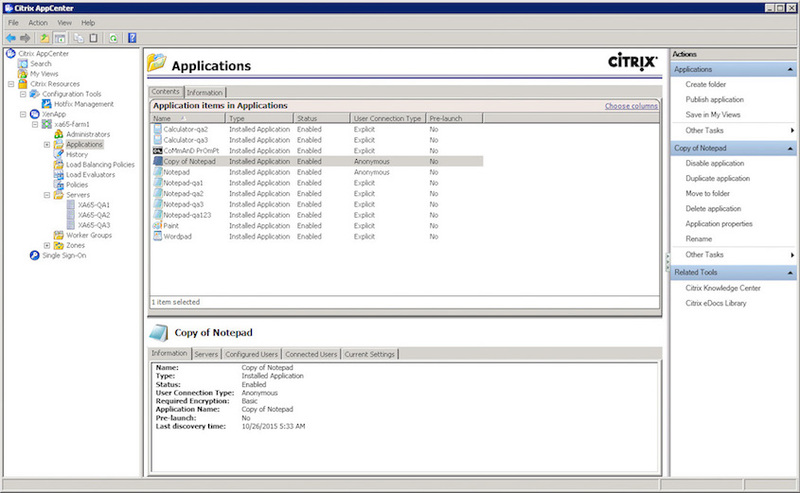 It is not an explanation of how to publish apps with Citrix. For information on publishing apps with Citrix, please refer to Citrix support pages. 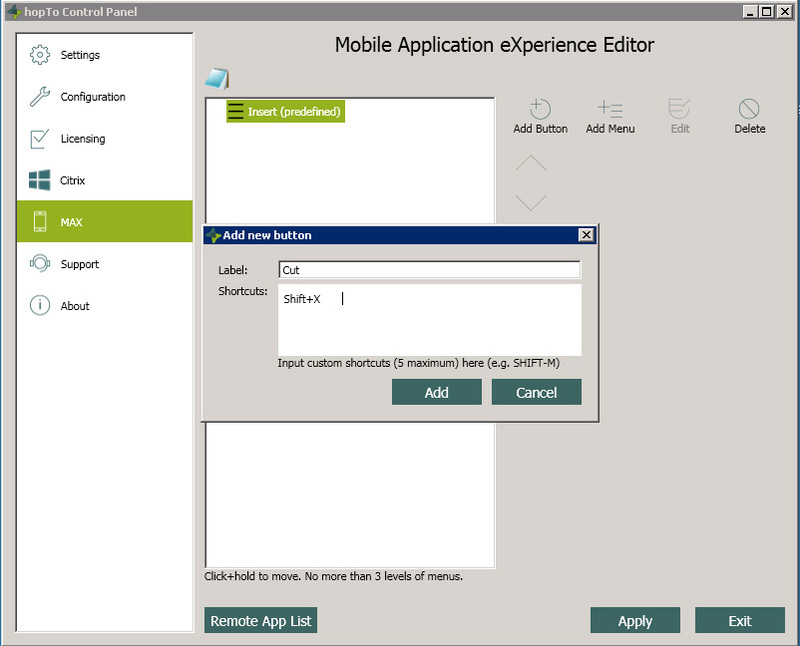 This sample screen shows the published apps in Citrix Studio on Xen 7.6. 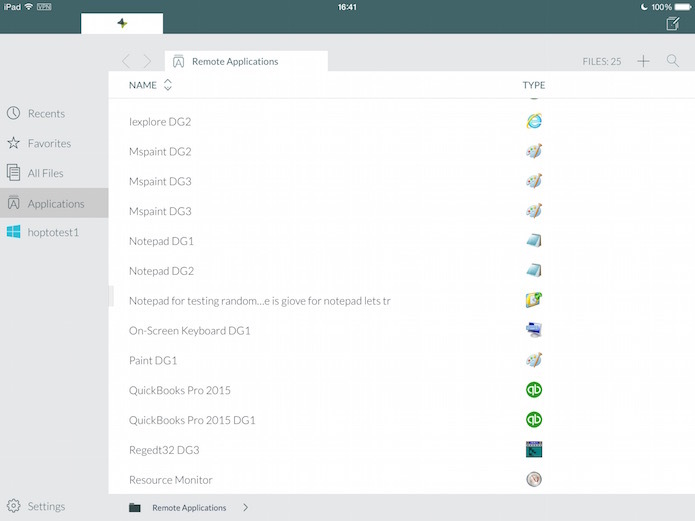 This sample screen shows the published apps in Citrix AppCenter on Xen 6.5. 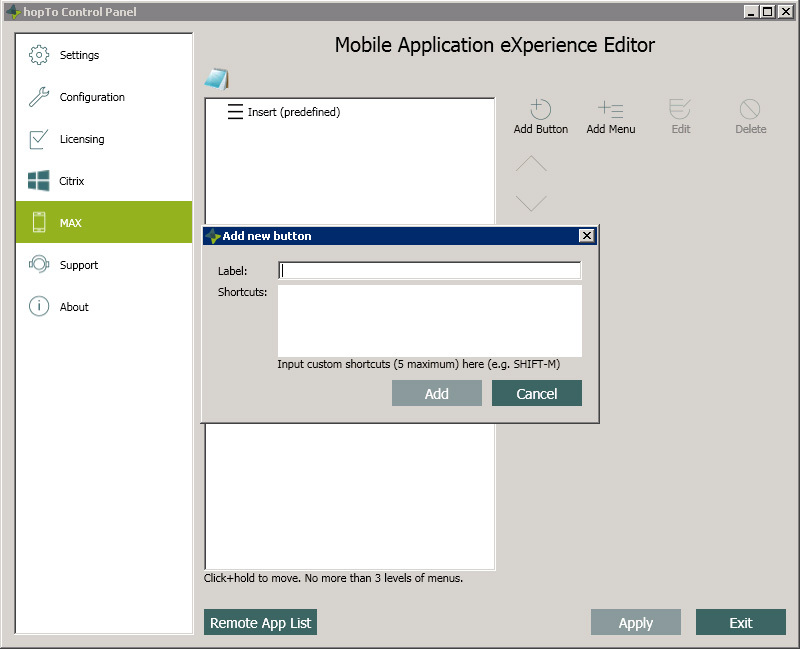 Once these apps are published in Citrix, you will see them on the hopTo Work Citrix Server Control Panel and in the Remote Applications on the client device, as shown in the next two screens. On the hopTo Work Citrix Server Control Panel, you’ll see your published apps from Citrix Studio or Citrix AppCenter once you’ve set up the hopTo Citrix Server. See hopTo Work for Citrix Control Panel. 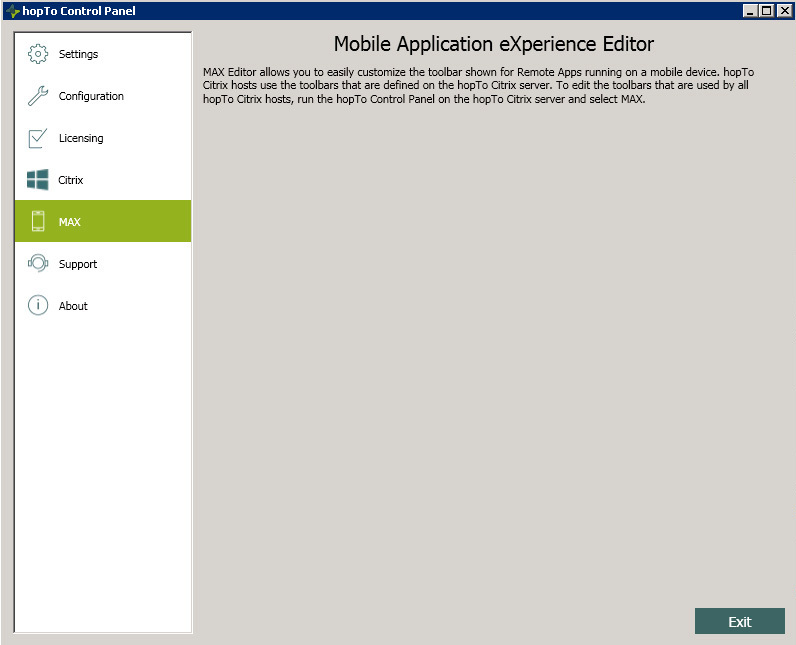 This screen shows the published apps that are running on the hopTo Work Citrix client.